The pace of environmental regulation in recent years may have been at the expense of its coordination and consistency. In many states, it can appear an amorphous and confusing, perhaps even spiteful, puzzle for business, the public, the legal profession, and possibly even those authorities charged with administering it. 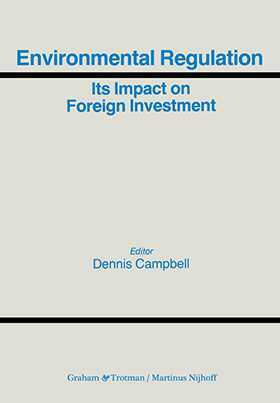 The information provided in this book provides a starting point for foreign investors in their investigation of the environmental regulations and the related social priorities which will have an increasing impact on their investment decisions and strategies. Often, in such matters, the first vital step is to be able to put the right questions. To facilitate that exercise, lawyers from Austria, Australie, Belgium, Canada, Denmark, England, Finland, France, Germany, Greece, Ireland, Italy, Norway, Portugal, Spain, Sweden, Switzerland, The Netherlands, and the United States have combined to provide this excellent analytical overview of the regulatory schemes and major environmental issues in their respective jurisdiction. A separate chapter is included on the rules of the EC.